Today I heard a story from the mother of a five-year-old boy. His name is Elijah. “Elijah, are you a good boy?” his mom asked. “Well, then, are you a bad boy?” she asked. Elijah makes a point I’d like to talk about. We all would like to be better and do better. Can you think of anyone who would not like to do better in their life than she is now doing? But there is a big gap between who you are today and who you want to be. In fact, there is a lot of pain in your relationship with your future self. Who is she? Where is she? Who is she with? Is she healthy? Is she more attractive or less attractive? Is she lonely? Did she accomplish what she was meant to accomplish? Have you felt that pain? What if I told you that you are already that person? Yes, already the person you dream of being. That you are already more than you could possibly imagine just by being you? Yes, you can’t do and have everything you want at this moment. What if you could? What if everyone could? WELL, LIFE WOULD BE INCREDIBLY BORING. You’ve made mistakes and have regrets? Are you unique in making mistakes and having regrets? NO. IF YOU DID EVERYTHING PERFECTLY ON THE FIRST TRY, YOU WOULD BE INCREDIBLY BORING. You know what you want because of who you are and who you were before you came to this planet. I believe it is part of your spiritual DNA. You are a daughter of God. You are a son of God. Do you know what that means? One thing it means is that you have the ability to become your best self. And becoming your best self means living up to who you already are. A daughter or son of God. Our Heavenly Father made life interesting. He made it possible for us to make mistakes. He granted us the gift of educational mistakes. Even though He could, He doesn’t tell us every minute detail, every precise step of our journey. That is up to us. It’s your trip. You are the travel agent. God gave you that privilege. The choice you make in the next minute will impact where you are going later today, tomorrow, next week, next year. If you have a really big goal like writing a book or climbing a mountain, what are you going to do in the next minute? I mean it—the next minute. Why would you do nothing? Because you are afraid of who you really are. And that fear blocks you from knowing what your next step is. It’s a game. Learn the rules. It’s fun. Life is fun. Life can be fun for you again. Seriously, I think it was meant to be fun. That’s why we don’t know everything about the trip. But you can know the next step. Thank you, Elijah, for reminding me how important it is to be who you are. P.S. Being who you are is not an invitation to be your unexamined, natural self. It is an invitation to reach higher, to see and believe in your best self, enabled by the grace of God. “And God is able to make all grace abound toward you; that ye, always having all sufficiency in all things, may abound to every good work” (2 Corinthians 9:8). You and I must be winners with a promise like that. At least we can be if we want to be. 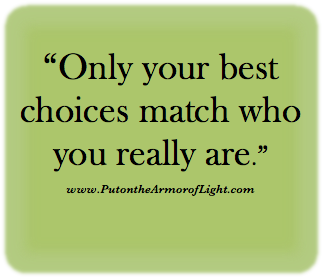 Only your best choices match who you really are.